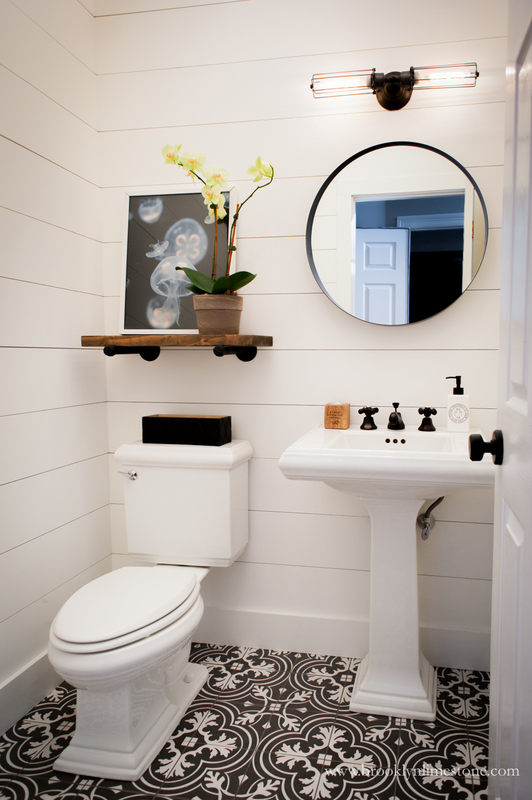 A builder's basic bathroom gets a fresh facelift with shiplap, graphic black and white tiles and and a few industrial accents. Ready for another impressive before an after? I shared a friend's living and dining transformation last week that just took a little bit of shopping to accomplish. This makeover involved just a tiny bit more work but it's so worth it! Let's take a look at the before. Perfectly functional but needed a style upgrade. 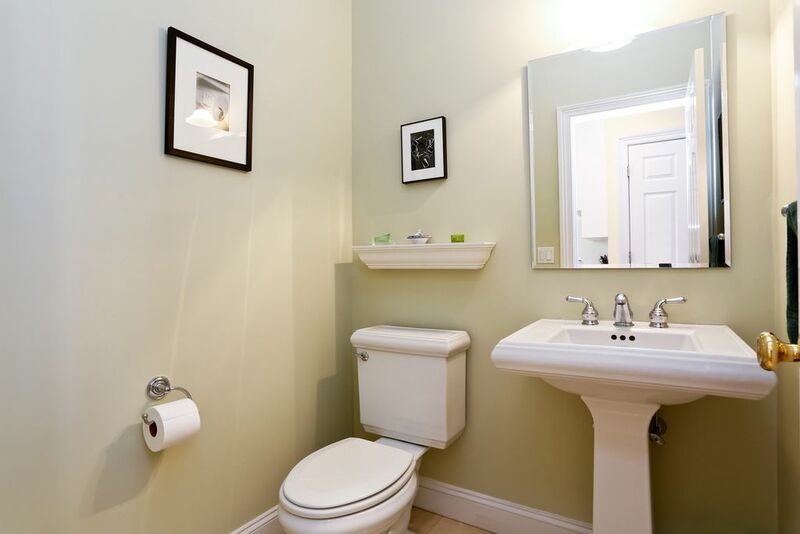 She kept the toilet and the pedestal and put most of her hard work/budget into the floors and the walls. She added texture by planking all 4 walls and painting a bright white. 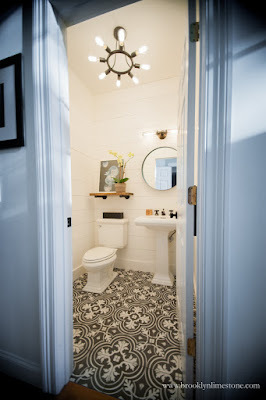 (She used birch plywood sheets in place of traditional shiplap but it looks just as good as the real deal) Then she added contrast with this cement tile like ceramic floor that is a total showstopper. All of that white is totally grounded by the black pattern. New lighting was key because this bathroom gets no natural light. 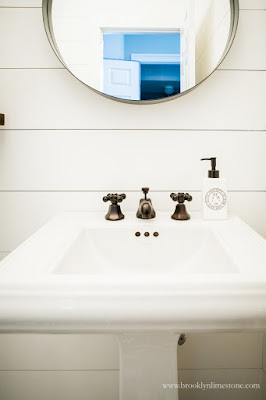 A new round mirror really softened all the hard edges in this space. Finally she made some decorative swaps with the mirror, towel wrack and shelves. My jellyfish print was the perfect finishing touch if I do say so myself! I totally love what she did - fresh and updated and making the most of the small space. What do you think? LOVE!!!!!!!!!! The floor is stunning, without taking over. Thanks! It took some convincing but I'm so glad she agreed. It totally makes the room so much more interesting. It looks fantastic. I love the the clean crisp look. 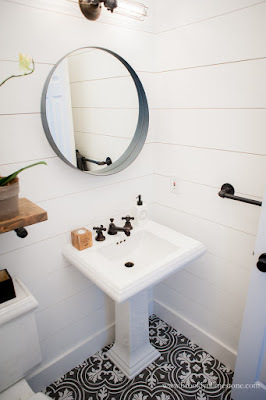 Please share about the shiplap - did they rip planks from a 4 x 8 sheet of plywood? Yes, she used sheets of birch plywood. The decided on the width of the boards so that they could get full boards on the entire wall without having to use thinner ones but I think they were about 10 inches wide. They had to be sanded a little but birch is pretty smooth. She also painted the sides before they went up to make it a little easier to get a nice even white coat. Hope that helps!